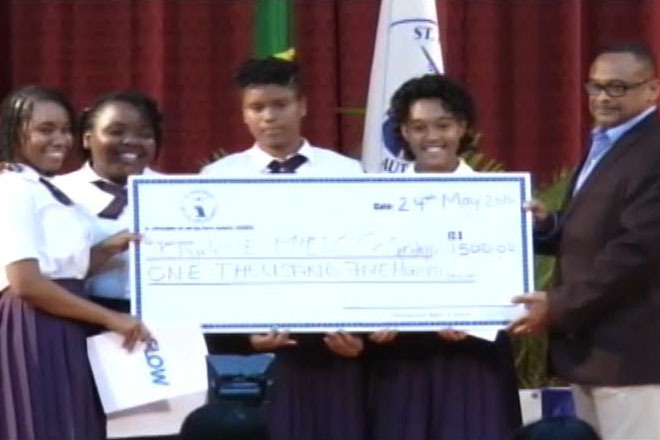 (ZIZ News) — The Charles E. Mills Secondary School is the new champion of The St. Christopher Air and Sea Port Authority Best in Class High School Competition. After intense game-show style rounds, including individual rounds, team rounds and speed rounds, the winners amassed a total of 105 points, a mere 10 points ahead of opponents, the Basseterre High’s 95 points. In third position was the Verchild’s High School. There was a tie at 235 points for the student with highest accumulated score. Tuesday night’s win is an upset in the competition’s winning history as for the past 4 years, the Basseterre High School has captured the title. The Charles E. Mills Secondary School was the first school to win the competition at its inception in 2011.